The Allison Library uses the Library of Congress Classification System to organize our collections. The Library of Congress system arranges subjects according to twenty-one branches of knowledge beginning from A and ending at Z. The majority of the Allison Library collection is in the B section which is also broken down into smaller sections. Each item is assigned a call number, which appears on the spine of the item, written vertically, designating both its subject and its place on the shelf. Call numbers have at least three parts: e.g., BR759 .B76 2010. First – one or two letters for the broad subject area and its subdivision: e.g.. BR759 .B76 2010. Second – numbers which subdivide the general subject: e.g., BR759 .B76 2010. Third – a letter and a number combination representing the author of the item: e.g., BR759 .B76 2010. It is important to note that the numbers in this section should be considered decimals and therefore B755 would indicate more precision (.755<.76) than B76 and come before B76 on the shelf. Please write down the complete call number listed in the catalogue record in order to find the item on the shelf. For this reason we also add a location code which appears on the spine label. There are several location codes but the most common are JRA (John Richard Allison), RSTC (Regent Stacks), or STACKS which all refer to the part of the collection that is the General Stacks, where items can be checked out. RREF means that the item is located in the Reference section of the library and therefore must be used in the library and cannot be checked out. See also: Reading Call Numbers. The Allison Library seeks to provide a quiet and welcoming space for students, faculty and community members to read, research, and study. We strive to provide guests with a positive experience by showing everyone respect and providing thoughtful assistance. Please inquire at the circulation desk if you have need of assistance. To ensure the preservation of our collections and to provide a comfortable environment for everyone, we ask that patrons speak quietly when talking; set phones and computer on silent; have drinks in spill-proof containers; and consume all food outside of the library. 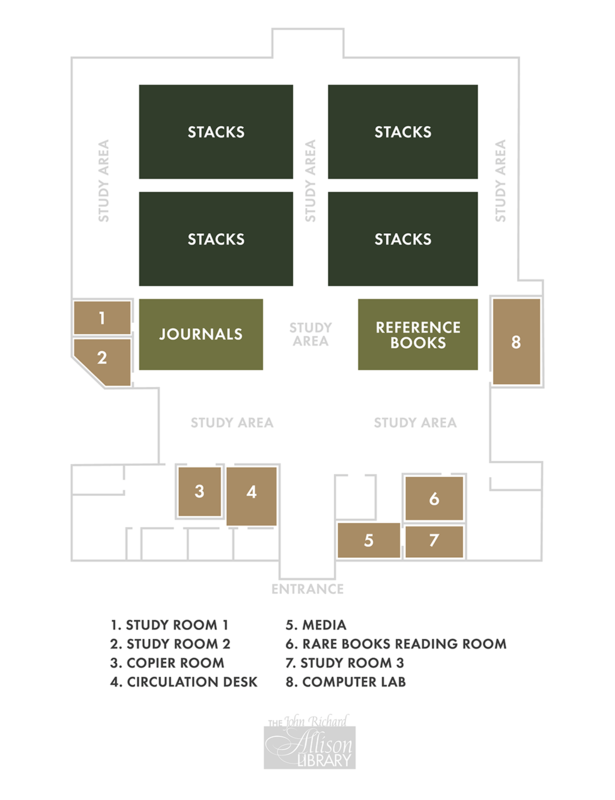 The library has three study rooms that are intended for quiet group study. These rooms can also be booked for individual use with the understanding that if a group needs access to a study room, the individual should be willing to give up the booking. Rooms 1 and 2 have a maximum capacity of 8 people, while room 3 is smaller and has capacity of 6. As in the rest of the library, we ask that no food be consumed and all drinks remain in a container with a screw top lid. Bookings can be made for up to three hours, three weeks in advance and concurrently. The study rooms are not intended as alternate classroom space or tutorial space since the rooms are not sound proof and one person lecturing or teaching a group does produce higher volume than a small group in quiet study. The Regent College Student Association (RCSA) maintains five computers for use by Regent students, all of which require an RWL (Regent Web Login) account to login. These computers are available for word processing, research, and email. If you have problems logging in, the circulation desk worker in the library may be able to assist you. In addition, students having difficulty using their RWL should contact the Regent Help Desk at helpdesk@regent-college.edu. Our library catalogue is accessed from our library webpage. In the library there are four computers set to the Allison Library homepage and can be used to search the online catalogue for the Allison Library. Our library catalogue will also provide results about availability of items at other libraries on campus and libraries worldwide. The computers in the library also provide access to databases. EBSCO includes five databases: ATLA Religion Database with ATLA Serials, New Testament Abstracts, Old Testament Abstracts, Christian Periodical Index, and Catholic Periodical and Literature Index. Other available databases include: Religious and Theological Abstracts (RTA), Bibliography of British and Irish History (BBIH), and the Canterbury Dictionary of Hymnology. When searching from home all databases require a username and password. The Allison Library has one computer which can be used to access to the internet, for printing documents and for research. Available on the two Mac computers, Accordance is the premier software for biblical studies, providing fast and powerful search capabilities with numerous resources and tools for advanced research in primary texts. It allows users to view Bible texts, dictionaries, lexicons, etc. as a series or tabs in a single window. The Allison Library offers photocopying, printing, and scanning services in the Copier Room located beside the circulation desk. Copiers require a username and password to access and a printing services card to have been purchased and redeemed for printing services. The Media section at the Allison Library offers multiple forms of media including microforms, audio and video cassettes, MP3, CDs, and DVDs. A television and DVD/VCR is available for use near the media section for in-library use. Audio cassette players are also available for patron use. Microforms, which are miniaturized pages of documents stored on film, are available in either microfilm or microfiche format. A microform reader is available to read these documents as well as to make print copies when needed. Audio cassette tapes may be listened to on audio cassette players that can be requested at the circulation desk for 2-day loan. CD players are also available for 2-day loan and can be requested at the circulation desk. DVDs and CDs are available for one week loan. DVDs may be viewed in the library as well as at the television and DVD player located in the media section. Earphones are available for use from the circulation desk. USBs are available for loan from the circulation desk.